Glimmer Mist by Tattered Angels is a fine water based spray that delivers just a touch of glimmer to all your projects, whether Paper, Acrylic, Metal or Fabric. Created by a Scrapbooker for scrapbookers, these products by Tattered Angels, are all acid free, archival safe and non-toxic. All the design on the layouts above were done from white card stock and using two of the Glimmer Stencils (a Compass Rose and Dragon Fly), some Garden Alpha Glimmer Chips and 3 colors of the Mist. How Do You Use Glimmer Mist? Glimmer mist can be sprayed on several different ways, all of which will create a different effect. 1. Shake the bottle very gently from side to side (Important - Do not shake up and down!) to mix up the Glimmer part that settles on the bottom. I try not to shake so as not to get air in the bottle, which sometimes seems to make the product come out in not so fine a spray. Don't forget to remix the bottle occasionally when working with it to keep that glimmer stuff from settling back to the bottom of the bottle. If too much of the glimmer particles get into the sprayer, it will clog up and you will have to clean it out. 2. For a Spotty, Raindrop effect, hold the sprayer closer to the work and begin spraying directly onto the work. This will give you the original look of Glimmer Mist and a thicker application which will also result in more color. 3. For a fine misting, press the sprayer as you move across the project. If you start the spray off the project and move onto the project, this provides a fine even misting of the paper if you hold the product away from the project like you do when using hairspray. 4. For a Smooth Satiny effect, start the spray off the project and move quickly as you spray across the area to be covered. Very quickly, wipe with a tissue or paper towel, being careful not to press hard with the paper towel so you don't leave the texture print of the paper towel on your work. This method will use a little more of your Mist to get the glistening effect, but the results are stunning, particularly if you mix colors. 5. You can also spray the Mist on a craft sheet, allow it to puddle in droplets, and rub your project in the Mist. I do this with paper and fabric flowers for color variation. If you do this on a glossy paper, the effect with be a marbled one. 6. You can also brayer it on. Again, I spray it on a craft sheet, run the brayer through the spray on the craft sheet, and then brayer onto my project. 7. This is something that I have done, but have not seen done anywhere else. I have sprayed Glimmer Mist on a craft sheet and used a paint brush to paint it on. I did this with some Christmas cards for a background. Here's a link: Painting with Glimmer Mist. Tip: Practice a little with each of these techniques. Please protect your work surface as the dye will stain. Keep your work surface protected and have some tissues or paper towels or Handi-wipes on hand as well. There is a craft mat and 2 sizes of misting mats that can be purchased for use with the Glimmer Mists. 8. Allow the project to air-dry or heat set. Remember, when spraying, this is a water-based product and paper based projects can warp or wrinkle a little, but should dry pretty flat. Positive Image - The Compass Rose and Dragon Fly at the bottom of the layouts were made by placing the Glimmer screen shapes on the paper and spraying Glimmer Mist on top - then removing the Glimmer screen. 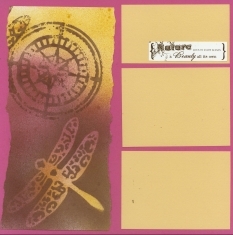 Negative Image - The Compass Rose and Dragon Fly at the top of the layouts were made second. After spraying the Glimmer screens and removing them from the paper, the screen was carefully turned over and the glimmer mist that had collected on the top of the screen was placed against the paper - creating a negative or reverse image from the original one. Unfortunately you can't see the shimmer on this paper, but it glistens all over. Click here to see more Glimmer Mist Examples. 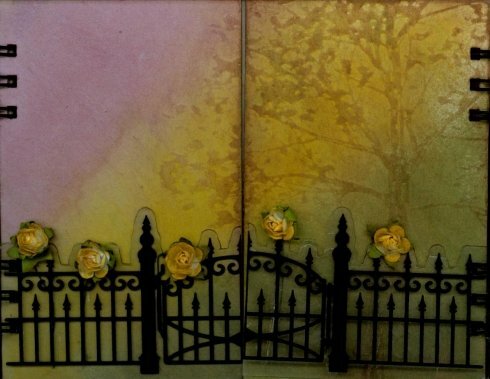 Learn great techniques to create gorgeous works of art out of any scrapbooking and card making project using Tattered Angels products, including Glimmer Mist, Glimmer Glass, and more! This DVD is approximately 60 minutes and is well worth the price to see the pros use this wonderful product. Recently a second DVD - The Tattered Angels Creme Collection - has come out featuring 12 techniques for using the Mists with Glimmer Screens and Glimmer Chips, some newer products to the Tattered Angels line, plus the original techniques from the first DVD. There are 86 Standard Colors to choose from in numerous color families, each with a different shade of color & glimmer. There are 17 Blues, 8 Greens, 6 Yellows, 9 Oranges, 6 Reds, 10 Browns, 10 Pinks, 7 Purples, 2 Blacks, 8 Metallics and 3 Clear Colors. In addition to the Standard Colors, the addition of the Limited Edition Seasonal Colors for 2009, 2010 and 2011 of 4 kits of 6 new Limited Edition colors for Winter, Spring, Summer and Fall. I was fortunate enough to pick up the Summer 2009 Kit at the Scrapbook Expo in Atlanta. They are stunning and bold Citrus Colors called Dream Sickle an orange with pearl shimmer, Lemon Meringue a bright yellow with silver shimmer, Sherbert a reddish orange with pink shimmer, Cherry Limeaid with a silvery and green shimmer, Riptide a dark blue with blue and silver shimmer, and Lime Twist a bright green with pearl shimmer. These were a great collection of colors for any summer or beach layouts and cards. Also available is the 2009 Fall Collection. There is a nice blue with gold shimmer called Fall Breeze, a light burgundy with a gold red shimmer called Indian Corn, a black with a smokey dark blue shimmer called Cinder, a beautiful golden tan in Caramel Apple with a silver opalescent green shimmer, a Pumpkin Pie which is a burnt orange with orange and brown shimmer, and a rich reddish brown with a silvery gold shimmer called Pinecone. The 2009 Winter Collection has a greyish blue called Arctic Blue which is a navy blue with a silver gray shimmer, a beautiful Candle Light which is a yellow orange with a silver shimmer, Pashmina a purplish pink with a gold pink shimmer, Marshmallow white with a pearl shimmer, and Frozen Lake bluish green with silver shimmer - and we can’t have winter without Peppermint Stick a wonderful rich red with a silvery pink shimmer. The 2010 Spring Collection which I have not had an opportunity to purchase yet has Cosmos pinkish purple with bright gold glimmer, Delphinium purplish blue with a white & purple glimmer, Flower Power peachy orange with pink & gold glimmer, Lemongrass soft yellow with a green glimmer, Spring Rain pale blue gray with blue and purple sparkle, and the Sweet Clover light green with multi-color glitter. The 2010 Summer Collection includes Bubbles a clear with a silvery blue shimmer, Hula Hoop medium green with a gold green shimmer, Popsicle purple with a silver shimmer, Sunshine yellow with a gold orange shimmer, Tutti Frutti pink with an opalescent shimmer, and Waterslide blue with opalescent blue shimmer. The 2010 Fall Collection includes Apple a golden chartreuse with a golden copper glimmer, Autumn Nights a deep navy blue with a midnight blue glimmer, Dragon Fly a deep teal with a golden green glimmer, Granite a medium grey with a blackish silvery grey glimmer, Pomegranate a warm vivid berry fuchsia with an opalescent turquoise glimmer, and Sugar Maple a warm rustic orange with a coppery golden glimmer. The 2010 Winter Collection includes Gumdrop a medium to light green with a bold golden glimmer, Jack Frost a cool cerulean blue with a silvery white glimmer, Jingle Bells a bright marigold yellow with an opalescent golden green glimmer, Santa Baby a fun bright red with a bold green glimmer, Snow Queen a pale platinum like light coat with a golden glimmer, and Sugar Plum Fairy a warm burgundy purple with a soft pink glimmer. Great for holiday projects. The 2011 Spring Collection includes Bahama Blue a bright aqua with a silvery glimmer, Marmalade a warm orange with a red tint and copper glimmer, Rum Punch a red punch color with pink and light orange undertones and a light pink glimmer, Puerto Rico a deep blue purple with a sparkling light pink, pearlescent glimmer, Sun Sisters a tropical, bright yellow with a yellow glimmer, and Trunk Bay light blue with a vibrant light blue glimmer; like the waters of Trunk Bay. Don't these color names make you want to go on a cruise? The 2011 Summer Collection with a retro look includes Bell Bottom Jeans a deep indigo with a silver glimmer, Cadillac Pink a light, creamy pink with a pink opalescent glimmer, Mel's Diner a deep, rich red with a silvery glimmer, Pop Rocks a vibrant purple base with a silvery white glimmer, Route 66 a creamy white base with an asphalt-black accent, and Wheat Beer a yellow hinting at brown with a silvery green glimmer. What a great collection of colors for any heritage design. Unlike traditional Glitters, there is no messy glitter to fall off your project, either during or after construction. It seems to me when I work with glitter, it is in my hair and on my face for days! Not so with Glimmer Mist. 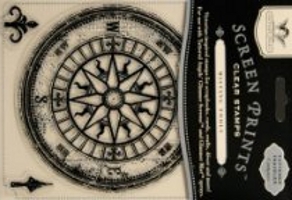 A Victorian-inspired set of clear stamps that match the Glimmer Screens for scrapbooks, handmade cards, crafts, home decor and more! Designed for use with Tattered Angels sprays, stencils and more. Use these stamps on almost any clear acrylic block although these stamps come with their very own stamp mount! These packages contain one 11-3/4 x 11-3/4 inch sheet of six stamps. Various themes are available like Trees, Notes from the Garden, Nature in Flight, Traveler Clock, Traveler Compass and Graceful Journey. Each is sold separately. 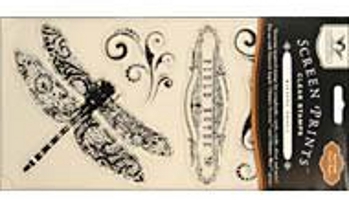 Glimmer Screens Victorian-inspired Fanciful Stencils are a re-usable set of heavy-duty plastic, very large stencils. Created exclusively for use with Tattered Angels' Glimmer Mist sprays. Use them with a mask to make background patterns, use them for dry embossing, even use them as a stamp or in conjunction with the matching Clear Stamps above. Simply place the Screens over your surface, and spray with your favorite color. These can also be used with chalks, paints, and inks. These come in several assortments with names such as Flights of Fancy, Decorative Corners, Garden Lattice, Tattered Traveler and Iron Works. or Glimmer Screens in the Tattered Traveler Set. These are about 4 inches in diameter. or Glimmer Screens in the Seaside Set. Glimmer Chips, with beautiful details embossed onto ivory chipboard, can take whatever you want to put on them. Spray with Glimmer Mist, dust with chalk, paint with acrylic paints or your ink pad, color with markers, and combine any of the above - and you'll get a different look every time! And, just to make things much easier to attach to your project, they are adhesive backed. Glimmer Mist in Sunflower to get the lighter color. from the word NATURE used as another embellishment. The Nature Chips package contains 32 pieces. These include a couple of magnifying glasses, butterflies, dragonflies, birds, leaves, owls, angel wings, and an elongated broach frame. Not just one or two in a set, but The Frosty Memories Glimmer Chips collection contains 49 pieces! From several snowflakes, two snow men with choices of items to have him hold such as a shovel, tree, wreath, skis, show shoes. Frosty Memories Glimmer Chips are perfect for your snow and winter scrapbook layouts and holiday cards. See the images in the very next section for Glimmer Glass to see the Frosty Memories images for Glimmer Chips that match the Glimmer Glass. Glimmer Glass is a set of transparent overlays that are acid-free and archival safe. These elegant adornments add beauty, dimension, and style to your creations in seconds! Distress, alter and "glimmerize" the overlays with the spray Mist or paint the backside and allow the black and colored designs show from the front. Yes! The Glimmer Mist works on Plastic and Much more! With embossed covers, the Albums have Chip & Glass accents and 10 inner pages, created for use with the Tattered Angels’ Glimmer Mist sprays. 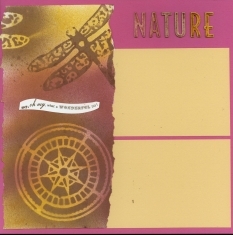 Spray, use your brayer or rub these shimmering inks over the cover to distress, alter and “glimmerize” your album. Three fold-out pages allow for panoramic layouts. Acid-Free and Lignin-Free. The Window Albums are tabbed chipboard albums with a Glimmer Glass Window accent in the front cover and are to be used as scrapbooks and journals. Distress, alter and "glimmerize" these albums with Glimmer Mist. 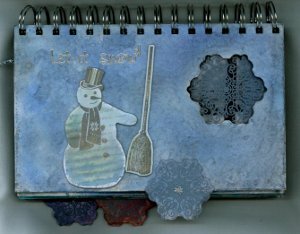 Spray, use your brayer or rub Glimmer Mist over the pages and tabs to create your own designer book. The Large Glimmer Glass piece is designed to be adhered under the front window, but should be removed prior to spraying album. Three additional pieces are included in the back of the book to be attached with a clear glue or simply by using Glue Dots. There are a number of Kits available with an assortment of products and usually 3 bottles, (1 oz each) of the coordinated Spray Mist for you to test drive. I purchased the Garden Album Kit and was very pleased. Everything I needed to complete the album was in the kit and it came with printed directions and 6 page idea photos. I already had about 35 colors of the Glimmer Mists and first got into using them in 2007. I still have some of my original bottles and they are still working very well. The product goes a long way. Glass, Stamps and Screens, and even the Misting Mats in 2 sizes. Add some of this wonderful and beautiful Glimmer Mist to your supplies. For an easy and fast way to add the Glimmer or Bling to your projects. products; or see product reviews.